A 5-foot-tall bust or Rev. Martin Luther King Jr. has been finished by world-renowned sculptor Zenos Frudakis and is scheduled to be unveiled 2 p.m., Thursday, completing Chester, Pa.’s $500,000 Martin Luther King Jr. Park at Sixth and Engle streets. Good for Chester to highlight its connections to one of the most influential and noble Americans of the 20th century. Rev. King lived in the city for three years serving Calvary Baptist Church , 1616 W. 2nd St., while studying at the Crozer Theological Seminary. The park project came about as a result of a request in the late 1990s by members of the city’s clergy to honor Rev. King. Three decades after his death the city had not so much as named a street after him. Mayor Dominic Pileggi, now a state senator, suggested the park thinking that a street-naming might be a bit anticlimactic since at least 40 other cities had already done so. And while the park was the right call there is nothing wrong with a street-naming as well. Changing 2nd Street where Rev. King’s old church lies, and which is State Route 291, into Martin Luther King Jr. Highway should be a no-brainer. Actually, it should be a no-brainer to do it for its entire length through Delaware County. Always underestimated Delaware County for reasons unknown likes to keep quiet its connections to greatness. Who, for instance, has heard of Philip Jaisohn ? Old-time county residents might remember him as their family doctor, but Jaisohn is the equivalent of Benjamin Franklin to the South Koreans. His home in Upper Providence was site of a pilgrimage by Korean President and Nobel peace laureate the late Kim Dae Jung. While there is a memorial to Jaisohn in Rose Tree Park, one would think that there might be a street named for him somewhere as well. One would think that the county’s tourist bureau would at least be trying to publicize these connections. Of course, when the county insists on calling itself Brandywine Country a serious problem of self-image is evident. Judith McGrane of Springfield submitted this about women demonstrating for the right to vote outside the White House were treated in 1917 by President Woodrow Wilson. Alice Cosu, thought Lewis was dead and suffered a heart attack. Additional affidavits describe the guards grabbing, dragging, beating, choking, slamming, pinching, twisting and kicking the women. Thus unfolded the ‘Night of Terror’ on Nov. 15, 1917, when the warden at the Occoquan Workhouse in Virginia ordered his guards to teach a lesson to the suffragists imprisoned there because they dared to picket Woodrow Wilson’s White House for the right to vote. For weeks, the women’s only water came from an open pail. Their food, all of it colorless slop, was infested with worms. The above is from an email that has been circulating around the internet for some time. Snopes rates it as true. What makes this especially interesting is that Woodrow Wilson, the man who gave us the income tax and Federal Reserve Board, is almost deified by progressive liberals. Wilson was a Democrat albeit not of the Jefferson-Jackson mold. He was an academic who at one time taught at Bryn Mawr College. He made his bones as president of Princeton University from where he was elected governor of New Jersey in 1910 followed by his election to the presidency in 1912 beating a divided Republican Party. In other words, he was a typical, manipulative progressive, liberal, big-government Democrat. Ludwig Wittgenstein is considered one of history’s great philosophers. He was born in Austria on April 26,1889, six days after another influential Austrian, who is right now ranked third on the list of history’s top murderers behind Mao and Stalin. Well, Wittgenstein went to school at Realschule in Linz which had a student population of 300 pupils, and one of his classmates was Adolph Hitler. It has now been reveled that talk-show giant Rush Limbaugh and Pastor Terry Jones of maybe-I-will-maybe-I-won’t burn the Koran fame were classmates at Cape Central High School in Cape Girardeau, Mo. Some appear to want to make an issue of this. Rush says he barely remembers the guy and wonders why people can’t accept that. He noted these same people easily accepted claims by one prominent person that he spent 20 years in a church without being able to recall what his own minister had been preaching. Historical apathy is threatening to do what the Spanish Navy could not and that is send the USS Olympia to a watery grave. It is the oldest steel-hulled ship afloat, and is an important record of 19th century transitional technology. The owner of the ship, the Independence Seaport Museum, says it cannot afford the $20 million-plus to maintain it. While $20 million is a lot, spending it on the ship would provide honest American jobs to save an treasure than could never be recovered if it should be lost. It would certainly be less of a waste than spending $20 million in federal money on propaganda signs for the “Stimulus” Act; or $20 million to repair a minor league ballpark in Lackawanna County for the New York Yankees, an institution that wouldn’t blink at paying that plus 50 percent for single-season’s work from a third-baseman. Worst comes to worst maybe they can move it down the river to Delaware County which has managed to find $30 million for a soccer stadium and talk the state into chipping in another $47 million. A nation that forgets its history is not going to last. Those in the 19th century understood this. Change Opportunity For Jim Thorpe, Pa? Change Opportunity For Jim Thorpe, Pa? — Sunday’s New York Times’ sports section carried a large story on the continuing saga of Jack Thorpe’s attempts to bring the bones of his father back to his home state of Oklahoma from his grave in Jim Thorpe, Pa. The Pennsylvania sports legend was buried in 1953 in the small borough that is the Carbon County seat after his wife, Patricia, who was Thorpe’s third wife and Jack’s stepmother, became angered at Oklahoma’s refusal to erect a monument to her husband. The Pennsylvania boroughs of Mauch Chunk and East Mauch Chunk were merging and offered to not just do so but to rename the new municipality in his honor if she would let him be buried there. Thorpe never set foot in the place. His road to fame started 100 miles southwest at the Carlisle Indian Industrial School which he led to a national collegiate football championship in 1912. Jack, 73, is now suing in federal court demanding the bones be returned in compliance with Native American Graves Protection and Repatriation Act of 1990. One has to admit that it is a bit of a stretch to use a law aimed at preventing the desecration of Indian grave sites to move Thorpe’s bones considering Thorpe was a life-long Catholic, a quarter Irish and a quarter French, and had never been buried anywhere else. Federal judges, however, have certainly been known to be whimsical in their interpretation of law especially in the pursuit of political correctness and praise from the wine and cheese set. Perhaps, it would be best for the borough to cut its losses and let the bones go. Of course, then it would need a new name. Maybe there is a long-ago sports great looking to return to a little bit of spotlight by agreeing to let his body be buried there. How does Mark Spitz, Pa. sound? Bruce Jenner, Pa.? Randall Cunningham, Pa.? Greg Gross , Pa.? They could open it for bids. The possibilities are endless. Feel free to make a suggestion. Author Bill LawrencePosted on July 26, 2010 July 13, 2017 Categories History, Sports2 Comments on Change Opportunity For Jim Thorpe, Pa? 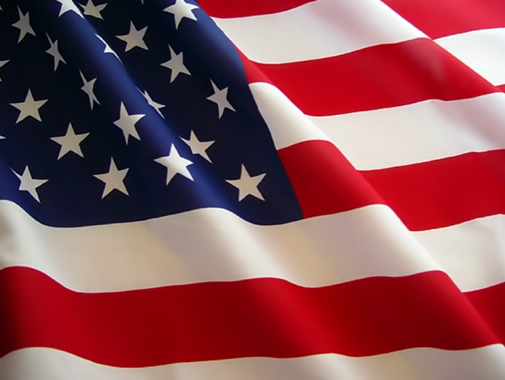 Star-Spangled Banner’s Final Verse — The complete lyrics to the Star-Spangled Banner. The last verse can be heard movingly sung by a former Marine at a Tea Party rally by clicking here . The USS Olympia, a national treasure berthed in Philadelphia, is in need of up to $30 million to keep her afloat and its owner, Independence Seaport Museum, has gone on record as being unable to do that. The ship, docked at Penn’s Landing across the Delaware River from the USS New Jersey, was Commodore George Dewey’s flagship at the Battle of Manila Bay during the Spanish-American War and from whose bridge he uttered the words “You may fire when ready, Gridley”. It is one of the very few vessels from that era still in existence. A few miles south opposite an IKEA store on Columbus Boulevard, the faded hull of the SS United States, once the fastest and among the most famous ships in the world, rusts away at Pier 82. 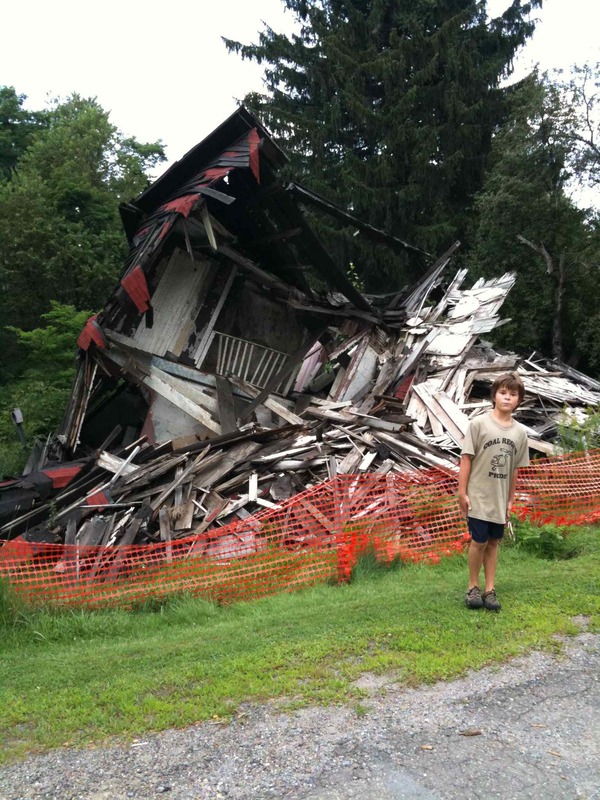 In Northeast Pennsylvania, the historic homes of Eckley Miners Village collapse under the not-so-watchful eye of the Pennsylvania Historical and Museum Commission. Reportedly, the Commission has refused volunteer help in maintaining the homes. Meanwhile, the Obama administration and his fellow Democrats sit on billions of dollars allocated to provide stimulus to the economy. What could be a better way of providing jobs than spending some of that on restoring some of these bits of history using local labor? Heritage maintenance is actually an legitimate role of government. FDR practiced it in our last depression. Of course, Obama doesn’t seem all that concerned about our heritage and this kind of spending doesn’t provide that much opportunity for bonuses for connected Democratic fat cats at Goldman Sachs and GMAC. Meanwhile, retiring state legislators such as Senator Robert Mellow (D-22) are finding that their pensions are going to be almost three times that of the $110,000 salaries they collect while working. Meanwhile, gym teachers are making $87,000 for 195 days of work. People, it’s time to start getting mad. The Nazis hated Christianity and Christmas posed a problem to them since it was Germany’s most popular holiday. Rather than ban it, they tried to replace it as described in this story at the TimesOnline, the website for the paper most of us in the U.S. know as The Times of London albeit in the U.K. it is simply the Times. 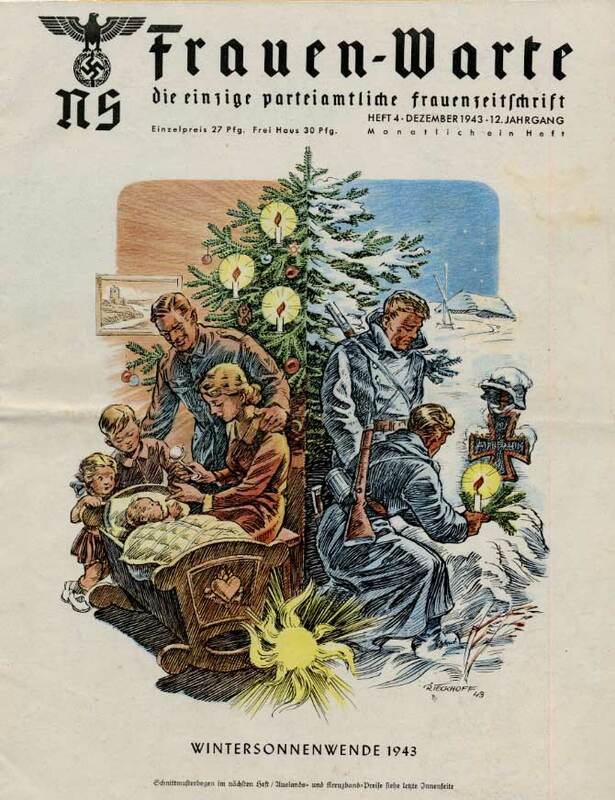 The Nazis replaced carols praising Jesus with secular songs about the season — winter wonderlands so to speak. They insisted Christmas trees be called fir trees, light trees or Jultrees. Something like that could never happen in Pennsylvania or the United States, right? As you enter a store during the next several weeks and are greeted for the season as attempts are made to sell you gifts for some undefined holiday; and if you see fir trees being sold for some unnameable event and if you see displays of such trees decorated with lights and called “festivals of light”, and if the local public school holds a “Winter Solstice” concert, well, just remember the tradition being followed. Pa. To Cut Funds To Brandywine Battlefield — Pennsylvania will no longer fund Brandywine Battlefield, a 52-acre paradise of very historic open space in Chadds Ford. Operations are now the responsibility of the Brandywine Battlefield Park Associates, which is an association of volunteers. Again we pay more and get less. The Pennsylvania budget has increased from $35.8 billion in 1998-99 — when there was no issue about funding the Battlefield — to $61.3 billion in 2008-09. Parks — and maintaining historical sites — are one of the few areas in which government generally does a better job than the private sector.